Houston Shower Remodel - Pioneers in Shower Remodel in Houston. Are you looking for a way to make your bathroom more beautiful? 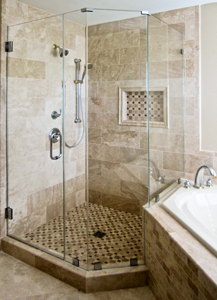 If you answered yes, then you should definitely consider getting frameless shower doors. You really can’t go wrong with them, as they help improve your bathroom’s functionality and their style is timeless. Aside from their high aesthetic appeal, frameless shower doors also raise the value of your bathroom. If you’re still not convinced, then read on and find out the reasons why you installing them is a great decision. Everyone agrees that frameless shower doors add a unique style to any bathroom. They are timeless as well, unlike other trends which tend to decrease in popularity after just a few years. It’s amazing how simply removing frames can make a bathroom so much more beautiful. And since they’re made of glass, they add a touch of elegance to your bathroom as well. 2. Make bathroom appear more spacious. A small bathroom can appear even smaller with traditional doors. Frameless shower doors put an end to this problem because it allows you to see the entirety of the bathroom, making it look much more spacious than it actually is. This is why it’s a popular choice among homeowners with small bathrooms. Visually, they do not seem to take any space at all. 3. Made from tempered glass. You might worry that since the doors are made of glass, they might get damaged easily. The opposite is true, actually. This is because frameless shower doors are made of tempered glass, which is strengthened to become more durable. The glass is usually 8-15cm thick. And in the event that the glass breaks, you’ll only see small chunks of glass with smooth edges so you don’t have to worry about dealing with sharp shards. 4. Choose between clear or frosted. Many think that frameless shower doors only come with clear glass. But you can also get frosted glass if you think it matches your bathroom better. There’s a variety of colors to choose from, which means you can have the perfect door for your bathroom. Both options are great, and they are easy to clean so maintenance shouldn’t be a concern. 5. Comes in different shapes. You can also get frameless shower doors in any shape you want. This is great news if you have a custom designed bathtub. You can have the frameless door shaped to perfectly fit the tub. This can significantly improve the appearance of your bathroom, making it look more elegant than ever. In addition, you can also choose from different styles of door knobs to make your bathroom even more unique. These are just some of the advantages of installing frameless shower doors. They are an excellent option if you want to remodel and increase the value of your bathroom. There’s no need to worry about dirty and rusty aluminum frames. You will surely love your new frameless doors once they’re installed in your bathroom. If you’re interested to remodel your kitchen, don’t hesitate to contact us. We’ll be happy to discuss the services we offer and provide you with the solutions you need for your remodeling project.